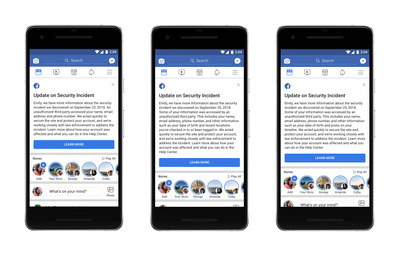 Facebook has said 30 million accounts were compromised in a major hack. That’s down from the 50 million accounts the social network first estimated, but it’s still not great news. Though Facebook has taken steps to protect users in light of the attack, the company said hackers had access to millions of people’s personal information. It said hackers could access an abundance of user data on 14 million people, including their name, email, phone number, hometown, current city, workplace, birthday, devices used to log into Facebook, the last 10 places they checked into or were tagged in, and their 15 most recent searches. With so much potentially sensitive data compromised, you may want to see whether yours was taken – and take action to prevent it from happening again. Here’s how to check whether your information was compromised, as well as how to delete your Facebook account. The message there will differ depending on whether you were affected. If you were, it will list the information of yours that was accessed. FacebookExamples of the customised messages Facebook plans to send. Facebook said users who were affected would get a message in the coming days with information on what they can do to best protect themselves and their privacy. 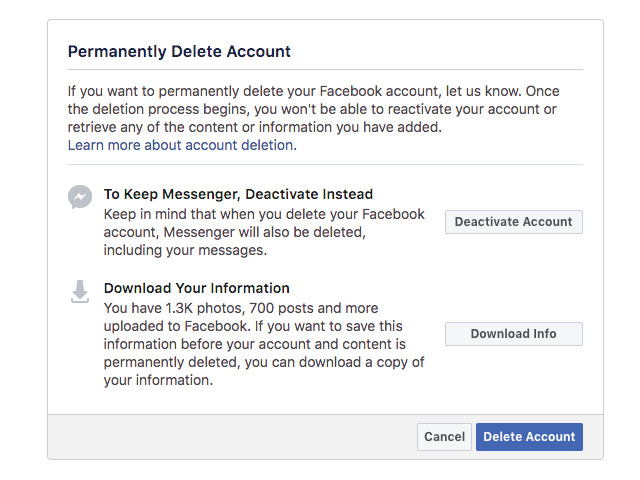 By deleting your account, you will remove your personal information from Facebook’s servers. 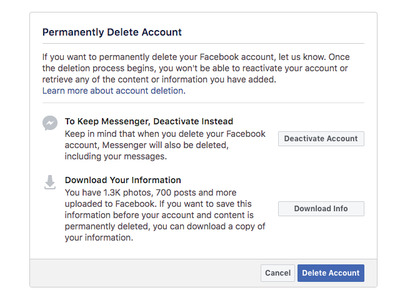 This will delete everything you’ve ever put on Facebook – profile information, photos, status updates, timeline posts – but it doesn’t include messages sent via Facebook Messenger. However, it will take 30 days for your account to actually be deleted. This “grace period” used to be 14 days, but Business Insider reported last week that Facebook raised it to a month to give users an opportunity to reactivate their account if they get cold feet. If you don’t want to lose everything you’ve put on Facebook, there is an option to download a copy of all your information. But you have to request this archive before deleting your account, and you’ll have it sent to you via email – if you delete your account before requesting the archive, you’re out of luck.